Born a slave, owned by Carpophorus, a Christian in the household of Caesar. His master entrusted a large sum to Callistus to open a bank, which took in several deposits, made several loans to people who refused to pay them back, and went broke. Knowing he would be personally blamed and punished, Callistus fled, but was caught and returned to his owner. Several depositors begged for his life, believing he had not lost the money, but had stolen and hid it. They were wrong; he wasn't a thief, just a victim, but he was sentenced to work the tin mines. By a quirk of Roman law, the ownership of Callistus was transferred from Carpophorus to the state, and when he was later ransomed out of his sentence with a number of other Christians, he became a free man. Pope Zephyrinus put Callistus in charge of the Roman public burial grounds, today still called the Cemetery of Saint Callistus. Archdeacon. Sixteenth Pope. Most of what we know about him has come down to us from his critics, including an anti-Pope of the day. Callistus was on more than one occasion accused of heresy for such actions as permitting a return to Communion for sinners who had repented and done penance, or for proclaiming that differences in economic class were no barrier to marriage. This last put him in conflict with Roman civil law, but he stated that in matters concerning the Church and the sacraments, Church law trumped civil law. In both cases he taught what the Church has taught for centuries, including today, and though a whole host of schismatics wrote against him, his crime seems to have been to practice orthodox Christianity. Martyred in the persecutions of Alexander Severus. Cousin of Saint Lambert of Lyon. Educated in Therouanne by Lambert and Saint Omer. She felt drawn to religious life from an early age, but was promised in an arranged marriage to Saint Ansbert of Chaussy. Dreading marriage, Angadrisma prayed for a miracle to prevent it; she was striken with leprosy. The marriage was broken off, Ansbert married some one else, and Angadrisma became a nun; the leprosy was cured the moment she received the veil from Saint Ouen, archbishop of Rouen. 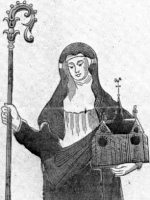 Abbess of the Benedictine monastery of Oroër-des-Vierge near Beauvais, France. Miracle worker. Once stopped a fire that was about to destroy her monastery by praying while holding up the relics of the house's founder, Saint Ebrulf of Ouche. Son of a wealthy merchant; as a young man Richard worked in his father's business. However, feeling a call to the priesthood, he studied at the University of Leuven, Belgium where he was an excellent student, and was ordained in 1555. He returned to Limerick, Ireland in 1556 and opened a school in an abandoned Dominican friary there. Chosen archbishop of Armagh, Ireland on Low Sunday in 1564. Arrested in December 1564 for the crime of acknowleding the authority of the Pope over the Church. After several months in prison, and multiple interrogations, Creagh escaped from the Tower of London on 29 April 1565 and fled to Leuven. He went from there to Spain and then back to Ireland in July 1566, resuming his ministry and preaching peace between the Irish and English. Arrested on 30 April 1567 in Kinelea, Ireland. A Dublin jury refused to convict Richard of anything, and his jailer helped him to escape, but in October 1567 Richard was arrested yet again, and again imprisoned in the Tower of London. He was kept chained, periodically interrogated, and systematically abused for years; he lost all his teeth and the use of one leg. Richard was released on bail in March 1570, and returned to Ireland where he resumed his ministry. Arrested again in May 1574, he was imprisoned in Dublin until February 1575 at which point he was returned to the Tower of London where he stayed until his death. While there, the periods when he was unchained, he ministered to other prisoners. Martyr. 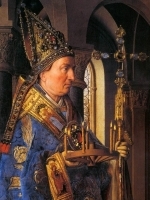 Seventh bishop of Rheims, France from 360 to 390. Greek Catholic. Graduated from the Lviv Theological Academy. Married. Ordained on 28 August 1941. Pastor of the Archeparchy of Lviv for the Ukrainians. Arrested for his faith on 9 September 1949 by the NKVD; imprisoned on Lontskoho Street, Lviv. Noted for loudly singing Psalms while in prison; his keepers thought he'd lost his mind. Died in prison; martyr. Immigrant to Rome, Italy c.308; ordained there in 332. Evangelizing bishop of Rimini, Italy in 346. Ordained Saint Marinus as deacon. Attended the Council of Rimini in 359 which condemned Arianism. Murdered by Arians. Martyr. Priest in the archdiocese of Lublin, Poland. Martyred in the Nazi persecutions. Priest in the diocese of Radom, Poland. Martyred in the Nazi persecutions. Pilgrim to the Holy Lands and then to Rome, Italy. Hermit at Arpino, Italy. Bishop of Todi, Italy. Saved Todi from being sacked by Totila the Goth. Converted many and showed the power of God over idols by destroying a temple of Pan and using the materials to build a church. Youngest of seven sisters, all of whom are honoured as saints in parts of Champagne, France. Hermitess. Nun, receiving the veil from Saint Alpinus. Sixth century monk. Abbot at Caer Gybi in Holyhead, Anglesey, Wales. Worked with Saint Cuby of Caernarvon. Manaccan, Cornwall is named for him. Bishop of Trier, Germany. Accused of sexual impurity, Rusticus feared the scandal would harm the faith of this parishioners, so he resigned and spent his remaining days as a hermit at Saint Goar. Bishop of Luni, Italy from 594 to c.604. Friend of Saint Gregory the Great who wrote about Venanzio’s personal piety and his apostolic zeal. Three brothers and a sister martyred together in the persecutions of Diocletian - Carponius, Evaristus, Fortunata and Priscian.